The Atlassian Bamboo team is proud to release Bamboo 2.5. Bamboo 2.5 brings a host of new Maven integration features to your favorite build tool. 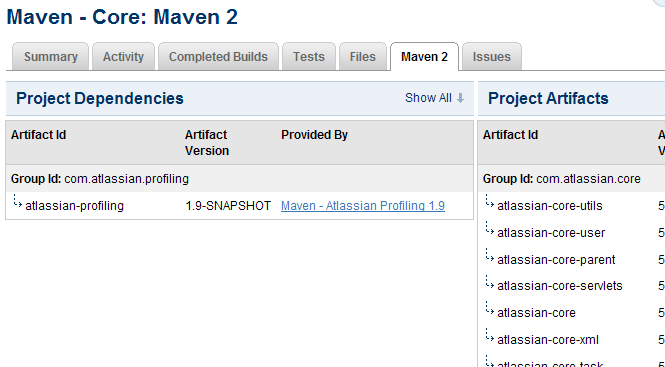 You can now elect to have your plan dependencies managed by your Maven project. Bamboo will automatically set up the dependencies based on the information in your pom.xml file. If you have information for a build plan already in your Maven project, you can import your plan into Bamboo as well. Simply specify the location of your pom.xml plus any required authentication details and Bamboo will do the rest. Two new bulk actions have been added to Bamboo in this release. The first new bulk action allows you to enable the new Maven 2 dependencies feature for multiple plans. The second new bulk action can be used to run manual builds for multiple plans without triggering dependencies (For example, if you want to run initial builds to create dependencies for plans with the Maven 2 dependencies feature enabled). We've also streamlined both the Bamboo setup wizard and plan creation wizard. Express setup options, inline functions as well as redesigned screens make it even easier for you to complete these setup tasks. Finally, if you are running Confluence, you will be happy to know that Bamboo gadgets are fully compatible with Confluence 3.1. Upgrading to Bamboo 2.5 is free for all customers with active Bamboo software maintenance. You can download Bamboo from the Atlassian website. If upgrading from a previous version, please read the Bamboo 2.5 Upgrade Guide. Bamboo 2.5 can now use Maven (Maven 2 only) to manage your dependencies between plans. You can choose to allow Bamboo to do this when you create a new plan or edit an existing plan that uses Maven 2 as the builder. Bamboo will automatically set up the dependencies based on the information in your pom.xml file. Read more about Viewing a job's Maven dependencies. We've also introduced a new feature that allows you to create a plan based on information from your Maven (Maven 2) project. There's no need to re-enter information already specified in the pom.xml. Simply enter the location of your pom.xml and any required authentication details, and Bamboo will parse the pom.xml to create your build plan. Read more about Import a Maven 2 Project. We've also added two new bulk actions to Bamboo, enable Maven 2 dependencies for multiple plans and run manual builds for multiple plans. Enabling Maven 2 dependencies for multiple plans allows Maven to manage dependencies between plans (described above). Running manual builds for multiple plans via the bulk actions menu runs the selected builds with option of triggering dependencies. Read more about modifying Multiple (Bulk) Plans. The plan creation wizard now allows you to create a plan without progressing through all of the steps. If you are cloning a plan or don't want to provide all the information on the latter tabs at the time of creation, you can save it after the second or third step respectively. If you are still working on your plan setup, you can prevent the initial build from running when you save too. We've also improved the Builder and Notifications tabs in the plan creation wizard. You can now add new JDKs, Builders, Mail and IM servers inline without leaving the wizard. Read more about the Creating a plan. We've streamlined the Setup Wizard for Bamboo in this release. If you are happy to use the default settings and embedded database bundled with Bamboo, you can get Bamboo up and running in only two steps. If you want to customize all of the settings, the longer version of the setup wizard has also been improved to allow you enter the required information in less steps. Read more about running the Setup Wizard.